The Soviet Union stayed silent after the explosion, exposing Ukrainians to the deadly radiation while Communist apparatchiks were evacuated from neighbouring cities. The event was finally uncovered by Western media two days later when Swedish scientists detected the pollution, but its effects were still vehemently downplayed by the Soviet Union as mere propaganda. Western aid was allowed into the country after an entire year of painful suffering and lack of medical care. Most recent data say the total Chernobyl death toll comes to over one million people all over the world, and this staggering figure is only bound to grow further, claiming more and more from the future generations. 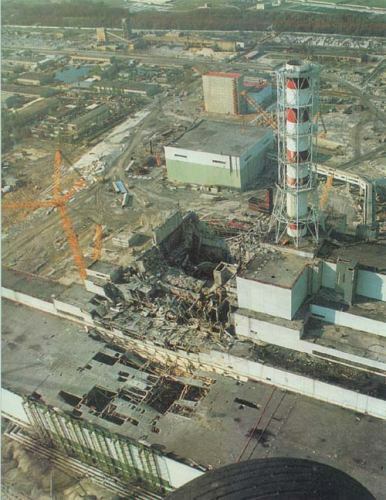 The bulk of the contamination covered the territories of Belarus, Russia, and Ukraine, but still it only made up 43 percent of the total radioactivity that was released when the multi-tonne reactor cover was blown away by a powerful explosion and the highly radioactive fuel from reactor 4 was dispersed into the atmosphere. Most of the radioactive particles fell out in North America, Africa, and countries in Europe and Asia. These are the data from the book entitled “Chernobyl: Consequences of the Catastrophe for People and the Environment,” which is to be presented in Ukraine’s capital, Kiev, today. The book was written by scientists from countries that have been most impacted by Chernobyl and includes data from a considerable number of studies undertaken in the past quarter-century in many countries of the world. Russian authorities and the atomic industry not only have not drawn any new lessons from the Chernobyl tragedy, but they have not even learned respect for the victims of nuclear catastrophes in general. There cannot be any respect in a situation wherein the majority of the victims are not even acknowledged. Such is the attitude to victims of the nuclear disaster at the Mayak Chemical Combine in 1957. Instead of apologies and a renewal of historic justice, the government seemingly is waiting for all of the victims to quietly die off. At the end of last year, the State Duma refused to enact a law defining those who were irradiated in utero by the 1957 accident at Mayak as victims of the incident. According to archives, some 2000 pregnant women were inducted to work on the liquidation of the accident, but their children, a small number of which are still alive, now cannot prove the harm their health sustained. From a legal point of view, they cannot be victims of the accident because they had not yet been born when it happened. The 1957 accident was kept under wraps until 1989 – doctors were forbidden to issue diagnoses confirming a link to radiation related illnesses, which means that today’s victim statistics aren’t worth the paper they’re printed on. In the first three years after Chernobyl, the data on those who suffered in the wake of the explosion at the nuclear power station were also extremely distorted and today the Soviet period data is hardly adequate. The maimed figures can be explained either by secretiveness or political expediency, but why has such a disrespectful and cynical attitude toward the victims remained? The answer to that question is almost obscenely simple: money. Atomic businessmen consider it their duty to deny any negative consequences of the nuclear accident, assuming that admitting to problems will tarnish the image of nuclear energy, which will negatively impact business. An international donors’ conference raised pledges of euro550 million ($802 million) to build a shelter to cover the exploded reactor building for the next century. But that was short of the euro740 million ($1.1 billion) sought for the shelter and a facility for storing spent reactor fuel. Once the enormous shelter is completed and slid over the reactor building on rails, expected in 2015, workers can begin disassembling the reactor and disposing the hundreds of tons of radioactive material inside. It is still not clear how that will be done or how much it will cost. “Right now, we don’t have the processes, but we are working on developing them,” Igor Gramotkin, director of the now-decommissioned power plant, told delegates. Chernobyl released a huge radioactive cloud when it blew up. Fukushima will exceed the Chernobyl release in a year no matter what else happens. the Toronto-based Children of Chornobyl Canadian Fund (CCCF) is marking the solemn occasion with the official opening of a special photo essay called Chornobyl: 25 Years Later on Tuesday, April 26 at 7 p.m. at the Ukrainian Canadian Art Foundation, 2118-A Bloor St. W., second floor. The exhibit, which runs from April 26 to May 4, features 24 documentary-style images snapped by Leslieville photographer Olena Sullivan.